On this evening, Becca Davis, and Nicola Noelle Buffa co-create a harmonious environment using Vibrational Healing of Sound, Light, Color, Aromatherapy, and Reiki touch; using a ceremonial setting in which people can feel free to have a thoughtful internal experience. They promote the use of meditation in individuals, creating harmony within their creative communities. Their mission is to create time, and hold space where people can gather to share in a meditative experience. Their intention is to offer an antidote to aloneness, by creating a common experience that brings people together in their time of individual meditation. This kind expression of gentle togetherness will allow you to feel shifted in your emotions. Come as you are, leave as you would like to be. Nicola Buffa is an Artist & Sound Healer who seeks to assist the natural Creative Spirit of our Collective Consciousness through the powerful transmutation of Sound. A daughter of Jazz Music and Art History, and has an educational background in Psychology, Art, and Communications. She has been studying Sound healing for the past three years in San Francisco, California. As a sound healer, she feels her life’s paths are converging: Her love of the human voice, a profound interest in human behavior and dream psychology, and her deep creativity as an artist and a performer. 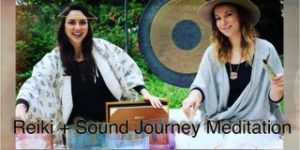 Drawing on all these interests she has opened her individualized practice, Source Field Sound, as a way to offer Upliftment on all levels through the Mind-Body medicine of Sound Healing. 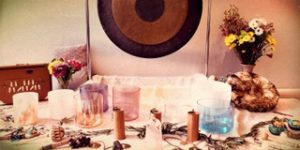 Her sound treatments incorporate Color Therapy, Healing Voice, and Guided Meditation in combination with pure-tone instruments: Alchemical Crystal Bowls, and Color Frequency Tuning Forks. Becca Davis resides in Marin, California where she runs her intuitive reiki healing practice. She began her personal journey into the holistic healing arts when she was introduced to yoga in 2006. Since then, she has received her Yoga teacher training certification completing 500 hours of training, and is a Reiki Master Teacher. Drawing on her own inspiration and experience with the healing power of sound, she helps guide the listener to open, balance and expand the natural state of the vibrational rhythms within the body, mind and the spirit. She is inspired to serve others along their journey to finding their highest potential.